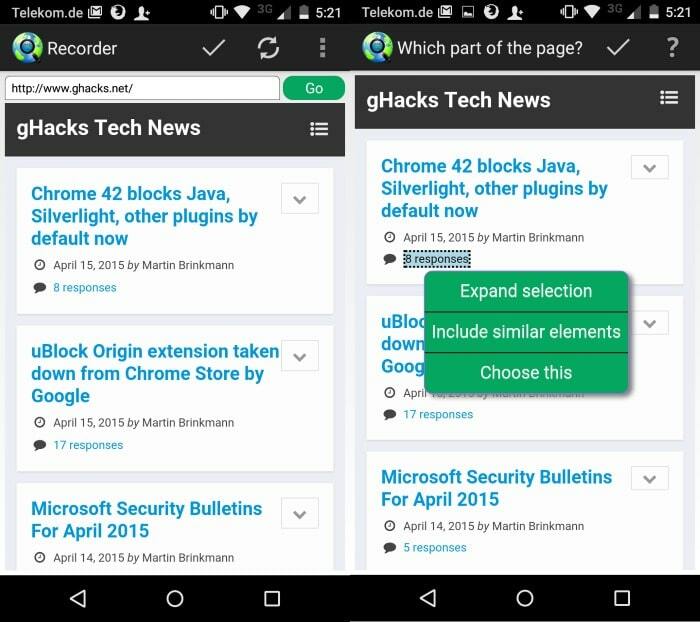 Web Alert is a free application for Android devices that monitors websites or parts of websites and notifies you of changes. It can be quite useful to keep an eye on websites: from monitoring the price of items on shopping sites to making sure you are notified the minute new content is added to a site. While you could check for those things manually, automation ensures that you are informed right after the change. Setting up new alerts is easy and powerful at the same time. Enter the address you want to monitor in the Web Alert interface and wait for the page to load. Tap on the check mark icon to enter edit more which allows you to select individual items on the web page or the whole page. Tap on the check mark again, verify the selection and the alert is set. 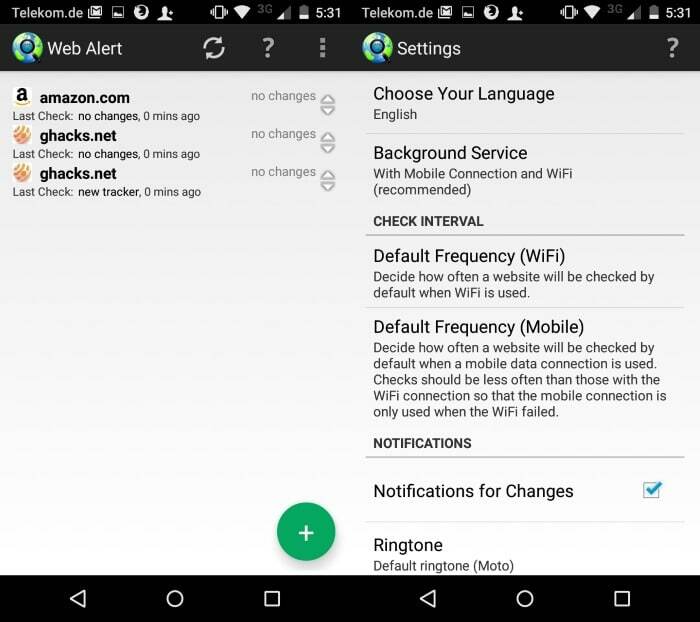 The application checks each item automatically every three hours when a WiFi connection is available and every six hours if a mobile connection is available. These values can be modified in the settings so that checks are performed as frequently as every five minutes or never automatically. That's however not the only selling point the application offers. The first part of it, in which you select the address, does more than that. While you can enter an address directly and have it or part of it monitored, it is also possible to navigate to a target using the app. A basic example is a site that requires authorization. Visit it, click on sign in, enter your login credentials, and navigate to the page you want to monitor. The application records those steps and will follow them when it checks for updates. This means that it can be used to check pages that require authentication or several navigational steps before the target page is displayed, for instance when you need to fill out a form before you are taken to the page you want to monitor. It means as well that you should enter the target page directly whenever possible to improve the checking efficiency. Notifications are created whenever a change is noticed by the application. In addition to that, ringtone, vibration and LED light notifications are provided and individually configurable in the program options. A tap on the alert opens the version browser which highlights changes in a textual interface. Removed items are highlighted in red while new ones in green. The app keeps old versions for a period of two weeks by default after which they are deleted automatically by it. It is possible to block that from happening for specific alerts or even all so that all versions remain available indefinitely. Only the textual contents of the site are displayed by the app which makes it less ideal for monitoring full web pages even though it works still. Options to quickly jump to changes would be welcome there as it would speed things up for pages with lots of contents. 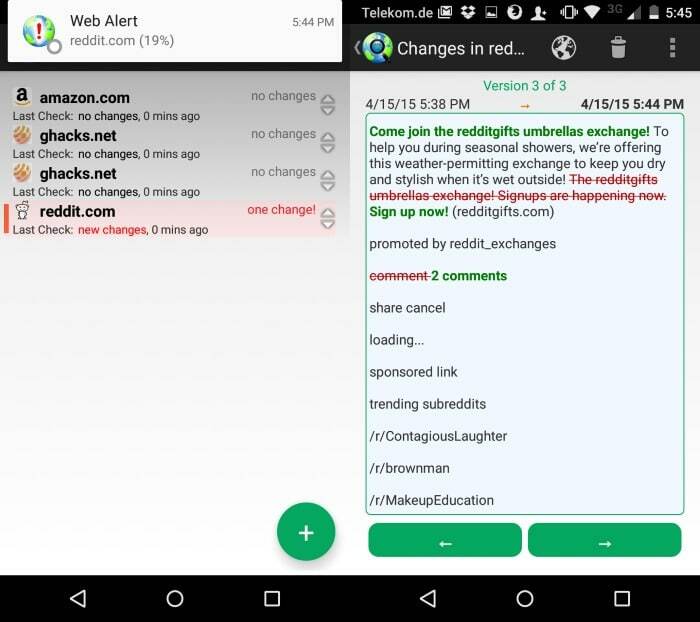 Web Alerts is a powerful application for Android that leaves little to be desired. It works equally well on individual pages that you want to monitor as well as sites that require authentication or other navigational operations before the page that you want to monitor is displayed. The app requires no extra permissions and is completely ad-free. Thanks! Yeah, this app is completely awesome! Right up there close to the ranks of Zooper and Tasker! I wonder if a desktop alternative exists. Re k5hu: I know a desktop alternative for watching webpages named “UpdatePatrol”, but it costs $129.95 and I’m not sure it is better than this app. It was a built-in selector like jQuery or CSS selectors and you can pinpoint anything in the webpage plus you can set conditions for alerts, not just on change.